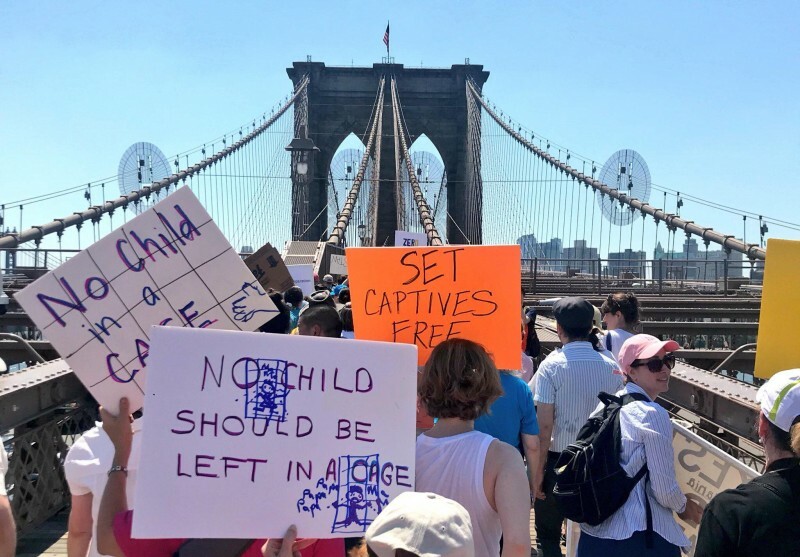 Thousands march across Brooklyn Bridge to protest U.S. immigration policy | Fight Back! New York, NY – Thousands gathered in Foley Square, a plaza flanked by several federal buildings, including the immigration detention office, in downtown Manhattan June 30 to protest unjust immigration policy. This policy, which was written in by the Trump administration and recently changed, stated that children should be separated from their families. These children ended in detention camps where they were left to fend for themselves. In audio clips you could hear the screaming and crying of children who were left alone without their loved ones. Thousands of children are still in government custody and parents are facing undue barriers trying to get them back. On Tuesday, a federal judge in California ordered that all children must be reunited with their families within 30 days. Yet, it remains unclear how a disorganized government will carry that out. The American Civil Liberties Union has reported that approximately 2000 families are still separated. The issue also hits close to home for New Yorkers. Last week, Mayor Bill de Blasio discovered 300 separated children had been brought into the city without his administration’s knowledge. The children were put under the care of foster facilities in East Harlem and the Bronx. The fate of the children is unknown, but on June 29 de Blasio announced that he is in support of abolishing ICE. However, ICE still has control and purview in the apparent sanctuary city that the boroughs make up.